In this day and age, setting up a server is a non event with cloud computing. I am currently behind in setting things up manually and scripts rather than using a tool. I have dabbled in Vagrant and Chef. I’ll admit that was some time ago and I will look into it again. In this post I will be attempting to migrate an existing webserver instance to a new instance from scratch from an Android tablet and see how long it takes. Disclaimer: I had tried this on cross country train journey in 50 minutes and failed so I have improved some parts already (more later). Internet connectivity is needed as well. On my first run I tethered to my phone however for this run I will be using the home Wifi. All devices were fully charged to make sure they don’t run out of battery during this experiment. All apps were setup and logged in where needed. I stopped the timer at 1 hour 9 minutes when I got stuck with database permissions. It was failing to connect to the database due to host checks and the database backup was failing to establish a SSH tunnel. Create a document with snippets / commands that are part of an application setup. I’m thinking of a checklist style document. A mouse would make text selection for copying and pasting commands so much easier! A case / holder which supports portrait mode would be hand for the large amount of scrolling text. It would be great if there were some changes to tools I used to help the process which I would love to see in order I see priority. alt+tab performance – The app switcher performance was horrible! I would try disabling animation to see if it improves however it would take a while for the app switcher to start and when it does the animation takes longer than I would like to finish. alt+tab selection behaviour – The first tab of the key combination to change app it would highlight / select the currently active app. If I was switching I would like the previous app to be selected first because I hit the key combination to switch and it’s hard to think people would do this by accident. I believe I can get it under 1 hour if I take the lessons learnt. 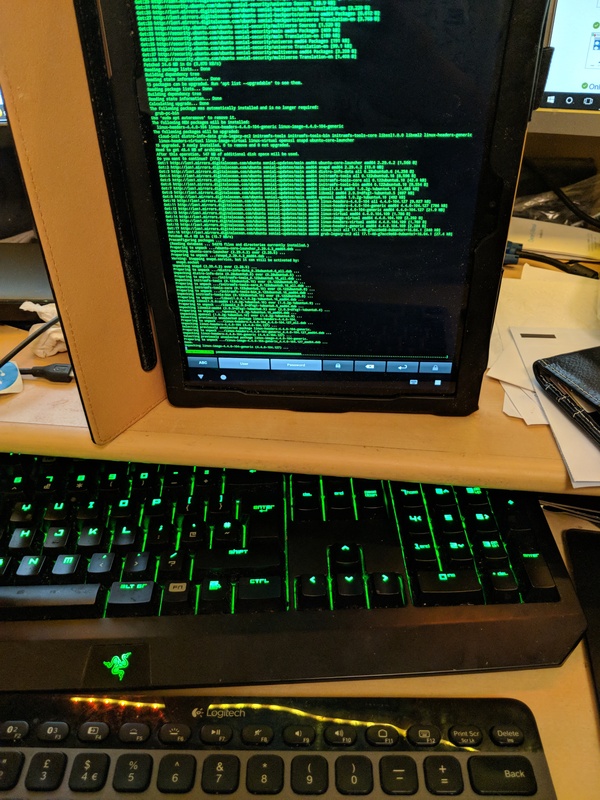 In reality, if I can use a configuration manager like revisiting Chef or alternative it would hopefully make a tablet deployment quicker and easier. I.T software professional always studying and applying the knowledge gained and one way of doing this is to blog. Danny also has participates in a part time project called Energy@Home [http://code.google.com/p/energyathome/] for monitoring energy usage on a premise. Dedicated to I.T since studying pure Information Technology since the age of 16, Danny Tsang working in the field that he has aimed for since leaving school. View all posts by Danny →	This entry was posted in Container, Web Server and tagged Android, digitalocean, JuiceSSH, k810, Logitech, pixel. Bookmark the permalink.